The Castleton bench, made of Indian limestone, was moved by a truck and forklift on Saturday for a dedication ceremony. Seven teenagers from local high schools designed the bench last summer at the Carving Studio with teacher and sculptor Nora Valdez of Boston. The bench in Castleton is about six feet long and 18 inches tall. It has two eyes carved in the center and a heart. Valdez said the bench is meant to highlight the importance of nature and taking care of the environment. 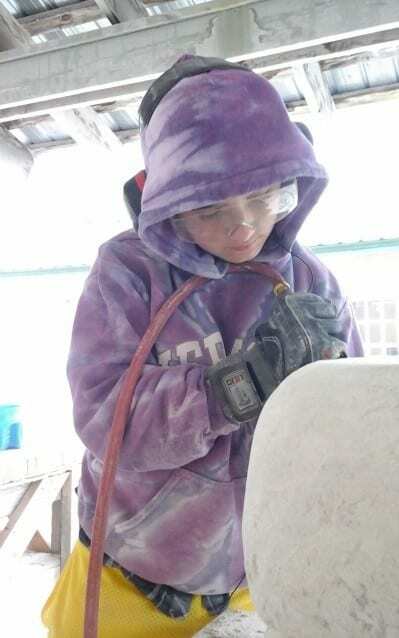 A teen contributes to the stone bench for Castleton. The eyes are meant to say, “Nature is watching us,” while the heart symbolizes a soul and says, “Nature has feelings,” Valdez said. Former Rutland High School student Ohan Bradley, 19, carved the heart. “I thought it’d pull the piece together,” said Bradley. The Carving Studio is a nonprofit in West Rutland that’s donated a bench to 10 different towns since the program began in 2009. There is a bench at the town halls in both West Rutland and Clarendon, a bench at the public library in Middlebury and one in front of the coop in Poultney, among other locations. The Carving Studio wants to put a bench in all 251 Vermont towns one day, starting with the towns in Rutland County. Black, an architect, had served on the board since 2009—when the community bench program began. He stepped down as president in December. The Carving Studio asks for donations and grants to fund the Stone Bench Project—which costs around $12,000 a year. The studio also asks the towns to contribute $500 to $1,000 to the benches. Castleton Selectboard member Zack Holzworth donated $100 out of his own pocket to the bench. “It adds to the overall aesthetics of the office and the property,” said Holzworth. The Carving Studio is recruiting students to work on next year’s bench, which will be donated to Proctor. Students first draw the design of the benches on paper and then build a replica out of clay before using chisels and hammers of different sizes to carve their design in the stone. “It blew me away for a two-week program,” said Bradley. Valdez, who was born in Argentina, has been carving stone since the 1980s. All of her artwork reflects concerns about society, individuals and people. “It’s a medium that’s disappearing,” Valdez said of her artwork. Valdez teaches about sculpting and speaks about it at symposiums around the world. Valdez said students gain confidence in themselves through the bench project. They learn to work together. Students also have a sense of pride to know they were part of creating something for their home towns. “It roots them to the community in a civic-minded way,” said Carving Studio Executive Director Carol Driscoll. The bench is meant to highlight the importance of nature.